Over the past few years, thanks to technology advancement, Americans have made cell phone or smart phone use part of their daily lives. Many even consider it a necessity to have their phone on them at all times for work or personal purposes. Cell phones are designed to provide us with the convenience of communication while on the go, and now smart phone owners have access not only to communicate via telephone but they can also access text messaging, emails, music, games, social media, and so much more. Cell phones were created to make life easier and more efficient, but when used irresponsibly, they can have disastrous consequences. With all of this technology available on a small handheld, it is easy to get distracted, especially if you are behind the wheel of a car. Simply answering a text takes away your attention for about five seconds, which is enough time to travel the length of a football field while in a vehicle. Recently there have been many public service announcements, campaigns, and programs developed to help educate the public on the dangers of distracted driving, however many still continue to use their phones while operating a vehicle. Luckily, developers have found a way to utilize one’s smart phone in a way to which may help distracted drivers focus on the roads. These six smart phone apps are designed to promote safe driving among young drivers, or any driver that wants to help battle the distraction of their phone. a. This program will monitor the location and driving practices of young drivers and can alert parents or a third party via text or email when the driver is exceeding a specific speed and will show where infractions occurred. a. This program limits access to email, texting, browsing, and calling when the driver is on the road. It will only allow calls to come through from a specified contact list using an online account for parents or third parties. a. This program will read the text and emails aloud and the driver can respond without having to touch a button. a. This program will restrict phone use when the car is running and send automated replies to incoming texts. It also gives parents an alert if the driver tries to bypass the device. a. This program teaches drivers proper driving procedures as well as logs drive time, mileage, and road conditions. Young drivers that use this may also be eligible for State Farm Insurance discounts. 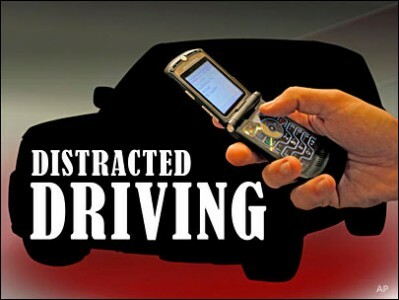 However, if you or someone you know does get charged with a crime or traffic violation as a result of distracted driving then call Collins Law Firm for a free consultation at 910-793-9000.